Abdu-l-Rahman Ibrahim Ibn Sori (a.k.a. 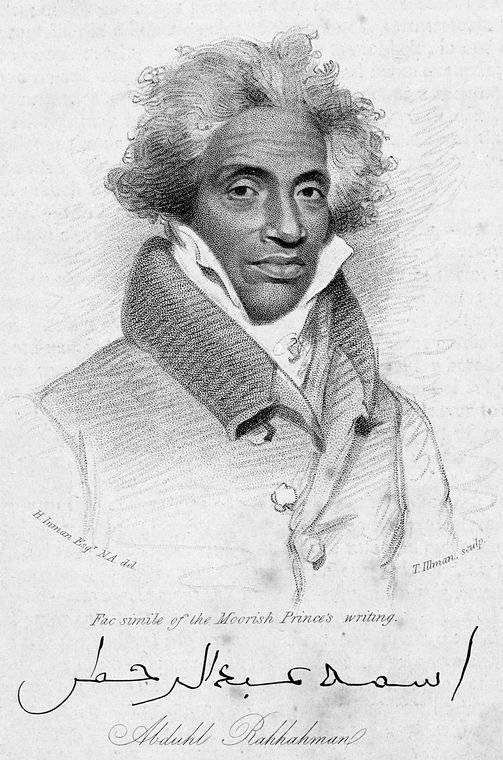 Abdul-Rahman) was a prince from West Africa who was made a slave in the United States. After spending 40 years in slavery, he was freed in 1828 by order of President John Quincy Adams and Secretary of State Henry Clay after the Sultan of Moroccorequested his release. He was captured near the Futa Djallon. He was born in 1762 in Timbo, Fouta Djallon (in present-day Guinea, Fouta Djallon). He was known as the “Prince of Slaves” or “Prince.” He was a Fulbe or Fulani, of the land of Fouta Djallon. Ibrahim left Futa in 1774 to study in Mali at Timbuktu. Ibrahim was leader of one of his father’s army divisions. After winning a battle against a warring nation, he took with him a few soldiers to report back to his father, when he was ambushed, captured, and sold to slave traders in 1788 at the age of 26. He was bought by a Natchez, Mississippi cotton plantation owner, and eventually became the overseer of the plantation of Thomas Foster. In 1794 he married Isabella, another slave of Foster’s, and eventually fathered a large family: five sons and four daughters. A while after that Abd al-Rahman moves to New Orleans. By using his knowledge of growing cotton in Fouta Djallon, Abd al-Rahman Ibrahim rose to a position of authority on the plantation and became the de facto foreman. This granted him the opportunity to grow his own vegetable garden and sell at the local market. During this time, he met an old acquaintance, Dr. John Cox, an Irish surgeon who had served on an English ship, and had become the first white man to reach Timbo after being stranded by his ship and falling ill. Cox stayed ashore for six months and was taken in by Abd al-Rahman Ibrahim’s family. Cox appealed to Foster to sell him “Prince” so he could return to Africa. However, Foster would not budge, since he viewed Abd al-Rahman Ibrahim as indispensable to the Foster farm. Dr. Cox continued, until his death in 1829, to seek Ibrahim’s freedom, to no avail. After Cox died, Ibrahim continued the cause. In 1826, Abd al-Rahman Ibrahim wrote a letter to his relatives in Africa. A local newspaperman, Andrew Marschalk, who was originally from New York, sent a copy to United States Senator Thomas Reed From Mississippi who was then in town at the time, who forwarded it to the U.S. Consulate in Morocco. Since Abdal-Rhaman Ibrahim wrote in Arabic, Marschalk and the U.S. government assumed that he was a Moor. After the Sultan of Morocco Abderrahmane read the letter, he asked President Adams and Secretary of State Henry Clay to release Abd al-Rahman Ibrahim. In 1829, Thomas Foster agreed to the release of Ibrahim, without payment, with the stipulation that Ibrahim return to Africa and not live as a free man in America. Before leaving the U.S., Ibrahim and his wife went to various states and Washington, D.C. He solicited donations, through the press, personal appearances, the American Colonization Society and politicians, to free his family back in Mississippi. Word got back to Foster, who considered this a breach of the agreement. Abdul-Rahman’s actions and freedom were also used against President John Quincy Adams by future president Andrew Jackson during the presidential election. After ten months, Abd al-Rahman Ibrahim and Isabella had raised only half the funds to free their children, and instead left for Monrovia, Liberia, without their children. Abd al-Rahman Ibrahim lived for four months before he contracted a fever and died at the age of 67. He never saw Fouta Djallon or his children again. The funds that Abdul-Rahman and Isabella raised bought the freedom of two sons and their families. They were reunited with Isabella in Monrovia. Thomas Foster died the same year as Abdul-Rahman. Foster’s estate, including Abdul-Rahman’s other children and grandchildren, was divided among Foster’s heirs and scattered across Mississippi and the South. Abdul-Rahman’s descendants still reside in Monrovia and the United States. In 2006, Abdul-Rahman’s descendants gathered for a family reunion at Foster’s Field. He wrote two autobiographies. A drawing of him is displayed in the Library of Congress. Among Henry Clay’s documents, for the year 1829 we find the January 1 entry, “Prince Ibrahima, an Islamic prince sold into slavery 15 years ago, and freed with the stipulation that he return (in this case the word “return” makes sense) to Africa, joined the black citizens of Philadelphia as an honored guest in their New Year’s Day parade, up Lombard and Walnut, and down Chestnut and Spruce streets. In 2007, Andrea Kalin directed Prince Among Slaves, a film portraying the life of Abdul Rahman.